Expect excellence when you choose TSI as your New Hampshire shipping company. We've been shipping to New Hampshire since 1989, we know all the tricks of the trade. Our professional carriers use their experience and knowledge to get your goods to you quickly, at affordable rates. Dedicated shipping specialists walk you through every detail of your service and complete complicated paperwork for you. Get more when you ship with TSI. Your time is valuable, why not let us prepare for you? Here's how it works. If you choose our White Glove service, professional movers prepare your items for you. When your goods arrive at their destination, just tell our two-man moving team where you want everything. They’ll unload and deliver inside, so you'll have extra time to relax. Why choose TSI as your New Hampshire shipping company? We’ve been a leader in the shipping industry since 1989. We help thousands of families and businesses every year, and we want to help you. We know the ins and outs of complicated shipping regulations and will make your shipment headache and hassle-free. We only work with the best movers in the industry. Our carriers are thoroughly vetted and held to the highest standards. You can trust that your items are in good hands. Utilize our large network when moving pianos. We ship to New Hampshire and every state in the nation. You can relax knowing where your shipment is at all times. 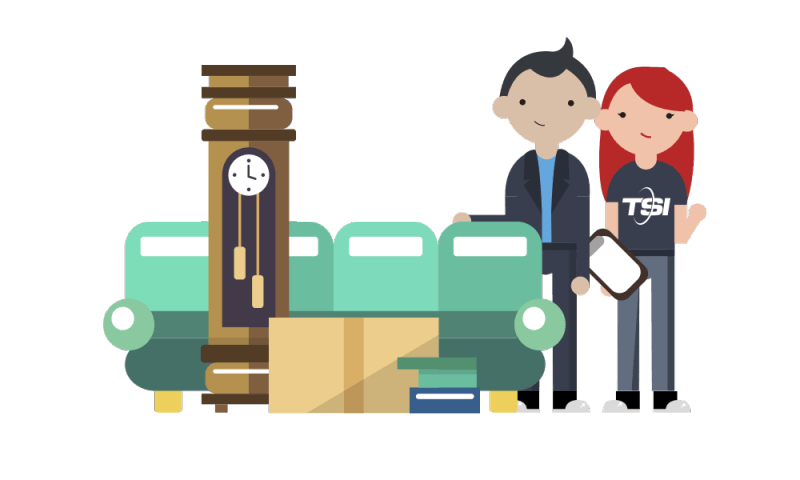 From the moment your goods are picked up to their timely delivery, you’ll be kept in the loop. I live in the Los Angeles suburbs, but I had to make arrangements to move my 85 year old sister from North Carolina to an Assisted Living Home here in LA. After doing some online research I contacted TSI and dealt with Steve Sergeant. Steve guided me through the process of the move, provided me with transportation and packing suggestions, and very fair $ estimates. He then assured me that my sister would be getting "White Glove Service" - and it was just that! Her belongings (furniture, delicate collectibles, clothing, lamps, framed pictures, etc) were delivered ahead of schedule in LA and in perfect condition. Furniture items had been professionally packed by the crew in North Carolina, and were delivered by an equally professional crew in LA. The entire experience with TSI exceeded my expectations. Bravo to a great company! White Glove Service Across the Country! Get an online quote now. Or call our interstate shipping specialists at 1-800-626-1257 to learn more.